I have not heard from you now for a long time and of course I have not written neither, but it is not very comfortable writing with the sweat trickling down your nose on to the paper. I hope this finds you enjoying good health as I am happy to say it leaves us all here. I have been very ill with fever for some months, but am glad to say I have got rid of it, altho it has pulled me down very much. I lost 2 stone in two months and it came at such an awkward time when the College examinations were going on and which were all in my possession that I was obliged to attend, the Principal sent me home several times. You will no doubt have received the paper I sent you announcing my transfer to Allahabad. There was no one more taken by surprise than I was when the appointment was offered to me by Scy to Govr Colonel Fraser, my higher flight of fancy never reached to this and yet here I am at the seat of Govt in Allahabad, as Assistant Secretary to Government, North West Provinces and Oudh, Public Works Department . A position of great trust and responsibility in charge of Govt Secretariat. 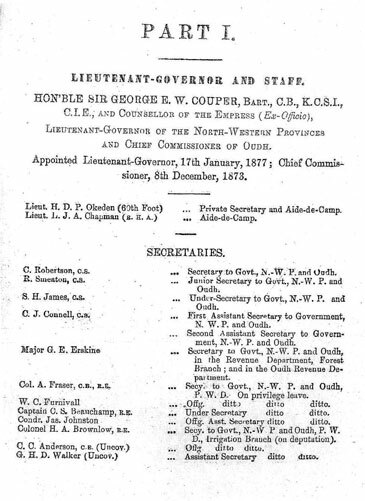 Civil List (1st page) for North West Provinces and Oudh 1878. Conductor James Johnston is mentioned four lines from the bottom. NB: Conductor was the most senior rank of Warrant Officer in the army. I have left the Army as I could not hold the appointment otherwise, but the Governor General in Council has been pleased to allow my back service in the Dept to count towards my Civil Pension, which is a great boon. My appointment has astonished a great many here who were applicants, – but I have received the warm congratulations of every one who knew me. Officers with the Govt of India and elsewhere have written to me who knew me years ago. I have now been here a month in my new appointment. I find the work quite strange to me but hope soon to master it, – I only trust the climate of the place will agree with both myself and Letty- she was quite knocked up when we got here, she had all the packing to do at Roorkee before we left as I was on the broad of my back and could render her no assistance, the excitement kept her up for the time, but she felt it very much afterwards. This is such a different place from Roorkee; it is a very large Station with such long roads, and very hot in the summer. In fact there is very little cold weather and very few houses have even fireplaces, but we must put up with those things here. Here in the middle of Oct and we have to get ice to use with our drinking water. The children are both uphill although far away, about 550 miles from here, they will be coming home for the holidays at the end of the month; we get very good accounts of them in their reports. I am very sorry I have not been able to keep my word with you, but it cost me so much to get my place put to rights again and now again having to sell at a loss-my expenses here and to start afresh (means that) we are great losers for the present and my position here demands that I keep up appearance(s)- another drag on me in that being on the personal staff of the Lieut Govr as one of his Secretaries I am bound to attend all the levies-which I would rather avoid if possible. I suppose Mr Thos Boyd is married ere this, in a letter Lettie had from Lizzie she mentioned you were going to Midfield in connection with it. If you should see him, tell him of my new appointment. I suppose you have already mentioned it to Mr and Mrs Boyd. Letty says she will write to you when she gets a little more settled. At present we are all sixes and seven as we have a large house and furniture is so expensive. We are living alongside the Cawnpore Road and when I marched by this spot about 25 years ago, there was no a single home to be seen- the station has sprung up since. Have you heard from Anty at Cambridge? I hope she is well as Letty wrote to her but has received no reply-If I can manage it I will write by this mail. Letty joins me in love to self and kind regards to Mr and Mrs Neilands and Mrs Ross should you see them. Also Joseph at Midfield and Ann if she is still with the Boyds. 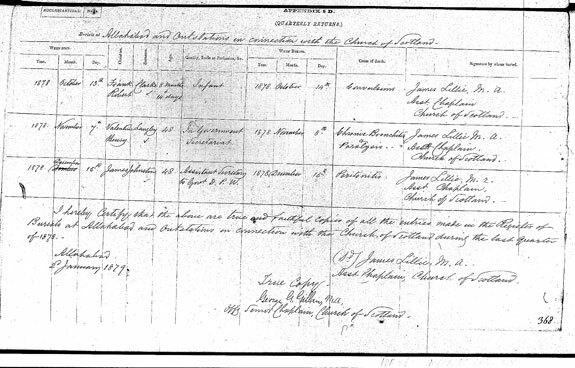 On the 15th December 1878 James Johnston died of Peritonitis and was buried the very same day by James Lillie M.A Assistant Chaplain Church of Scotland. He was aged 48. On the 28th March 1886 Letitia Jane Johnston died from measles and was buried the following day, 29th March at Mussoorie, North West Provinces. She was 46 and described as a widow.